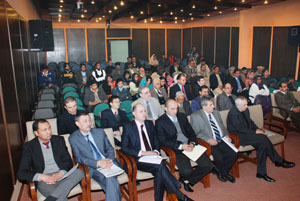 Preston University , Islamabad organized a seminar on “ Kashmir and Nagorno Karabakh:festering disputes”. The event was organized in collaboration with the Society of Asian Civilizations Pakistan, and held at the Islamabad Campus of the university yesterday. Eminent educationists and experts in international and regional affairs presented papers on the topic of the seminar. 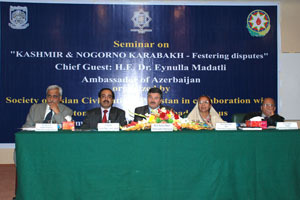 H. E. Eynulla Madatli, Ambassador of Azerbaijan was the chief guest on the occasion. In his keynote address, as the chief guest, the Ambassador of Azerbaijan, H. E. Eynulla Madatli highlighted various aspects of the conflict and dealt with the subject both from its historical perspective and its current international and regional standing. Ambassador Madatli said on the occasion that Naghorno Karabagh is the biggest problem confronting Azerbaijan today, because Armenia has illegal occupation over Naghorno Karabagh. He said that the occupation of Northern Azerbaijani territories was affirmed in the Gulustan peace treaty on October 121813 and Turkmanchay peace treaty on February 10, 1828 signed between the Russian Empire and Persia. After the signing of the Gulustan and Turkmanchay treaties, a rapid mass resettlement of Armenians in Azerbaijani lands took place, resulting in an artificial territorial division. In this way Russia created Armenian province in Azerbaijan land, he said. Further dilating on the subject, Ambassador Eynulla Madatli said that the facts illustrate that over the seventy years of the Soviet rule, the Armenians succeeded in expanding their territory at the expanse of Azerbaijan and expelling the Azerbaijanis from their historical lands. As a result, the territory of Azerbaijan, which in 1918-1920 constituted 114,000 square kilometers, was reduced to 86,600 sq. km during the Soviet rule. Ambassador Madatli asserted that the aggression against the Republic of Azerbaijan has severely damaged the socio-economic fabric of the country. He sought immediate resolution of the conflict and return of the occupied Azerbaijani territories by the Armenians according to the innumerable resolutions adopted by the UN Security Council in this regard 1n 1993. He also assured Azerbaijan’s utmost support to its Kashmiri brethren in resolution of the Kashmir dispute in accordance with UN resolution adopted in respect to the Kashmir conflict. Other eminent experts and analysts who vent their views on the subject were: Prof. Dr. Tahir Amin and Dr. Ishtiaq Ahmed from the Department of International Relations, Quaid-e-Azam University, Islamabad and Mr. A. Khalid Rauf, Chancellor, National Institute of Cultural Studies, Islamabad. The speakers highlighted different aspects of both the conflicts in its historical perspective, and presented a comparative analysis of the two problems of great regional and international significance. Mr. Z. 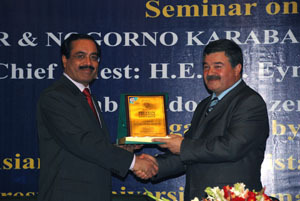 A. Qureshi, President Society of Asian Civilizations Pakistan (SAC) also spoke on the occasion. He highlighted some of the achievements of SAC, since its inception a decade ago. He briefly touched upon the subject of the seminar and presented the historical perspective of the Kashmir and Nagorno Karabakh conflicts. Earlier, in his welcome address on occasion Dr. Abdul Basit, Chancellor Preston University expressed his profound gratitude to the Chief Guest, Ambassador of Azerbaijan, H. E. Eynulla Madatli, and the distinguished speakers and guests for their presence at the seminar. Speaking on the subject, Dr. Basit emphasized that due to its strategic geographic location Azerbaijan enjoys a special place in the comity of world nations. He briefly spoke about the Kashmir and Nagorno Karabakh conflicts and emphasized that sooner these two grave conflicts are resolve the better it would be for regional peace, progress and prosperity. On Pakistan’s relations with Azerbaijan, he said that Pakistan has very strong friendly and brotherly relations with Azerbaijan, and sincere efforts should be continued to be made to further consolidate this relationship in the years ahead. Later, Chief Guest, Ambassador of Azerbaijan, H. E. Eynulla Madatli presented shields of Preston University to the distinguished speakers. Dr. Abdul Basit, Chancellor Preston University presented the University shield to H. E. Eynulla Madatli, Ambassador of Azerbaijan.